Even with the 70s forecast for Thursday and again next week, it’s not quite time to let down your winter guard. First, we have a chance of snow late Saturday. But beyond that, there are signs that winter could make an even stronger comeback next month. March tricked us last year when, strangely, it was colder than February. We may need to watch out for a late-season winter reprise this year, too. Potentially big changes lurk around the meteorological bend. A sudden stratospheric warming event is occurring across the very high latitudes. This warming of the layer about 30,000 feet high near the North Pole can trigger a chain of events that results in a cold pattern over the middle latitudes in the weeks that follow. 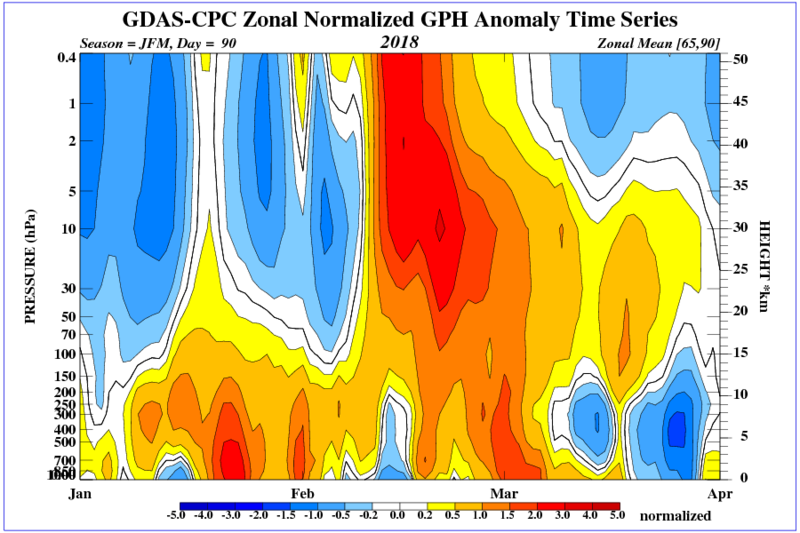 The graphic below shows a simulation of this high-latitude warming on one of the many models tracking this feature. Note the orange, red, pink and white shades, all of which indicate much warmer than normal conditions in the stratosphere in the high latitudes. In some places the warming is off the charts, and this particular stratospheric event is one of the strongest we have seen in a few years. It is forecast to reach its peak intensity in the coming days. Strong warming occurs in the stratosphere near the North Pole. Bigger events, like this one, translate downward to the troposphere, where weather happens. This results in the creation of high pressure and sinking air around the polar regions. Sinking air flushes cold surface Arctic air southward away from the pole into North America, Europe and Asia. Voila, winter is back again! What does it all mean for Washington? The very end of February and especially the early half of March could see another colder-than-normal period, which would also increase our chances to see some last-minute snowfall. Models are suggesting an increased likelihood of the establishment of high pressure zones at high latitudes, known as “blocking patterns.” Such blocking forces the jet stream southward, and cold air follows. Strong blocking patterns, on balance, tend to increase our snow chances. About 70 percent of the top 10 most “blocky” March patterns have ended up snowier than normal. But note, snowier than normal is a low bar — since the average snowfall is 1.3 inches. And even when blocking patterns become established, it is always a challenge for cold air and moisture to come together in our region. It’s unlikely we’ll get enough snow to make up for the winter’s deficit. Whether we get snow, it seems as if we’ll still see a period of colder winter weather before we can welcome real spring to the area. Temperatures could sometimes hold in the 30s and 40s for highs. Lows may dip into the 20s with maybe even a few sneaky teens. The durability of the cold pattern will depend on the intensity of the blocking, which is something we’ll need to monitor in the coming weeks. Old Man Winter is still breathing.